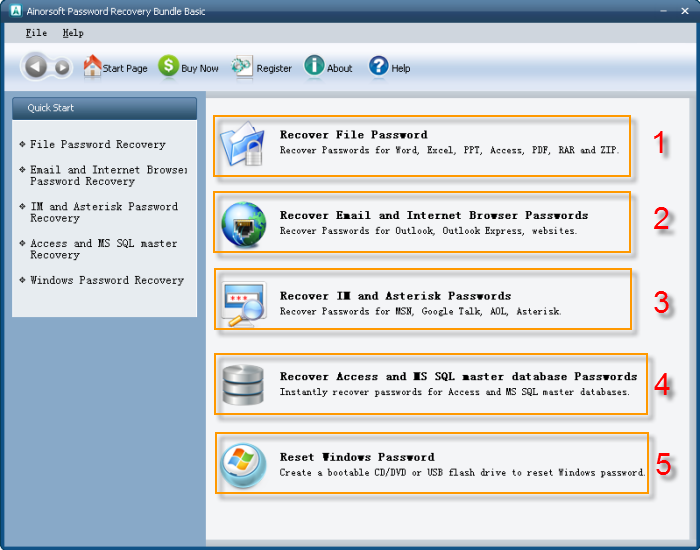 Ainorsoft Password Recovery Bundle is designed to recover lost or forgotten password for a wide range of Windows OS, WinRAR, WinZIP, Word/Excel/PPT/Access, PDF, SQL MSN, Outlook Express, Browsers and a variety of other applications & Files. Its easy-to-use yet powerful functions are highly recommended by the users all around the world.Ultrafast recover passwords for Windows, RAR, ZIP, Office, PDF, SQL, MSN, Browser, etc. Easily reset passwords for Windows, Excel, Word, Access, SQL, PowerPoint, Outlook, Outlook Express, PDF, RAR/WinRAR, ZIP/WinZIP, MSN, AOL, Google Talk, Paltalk, Trillian, Miranda, Opera, Firefox and IE Browser, etc. The latest and most advanced technology lead to 100% recovery rate and no data loss. Within several minutes, you are able to gain access to password-protected applications and files. User-friendly interface makes it easy for users of all computer levels. Just with several clicks, the recovery is finished. Empower you to offer a portion of password to reduce calculation and save password recovery time. Qweas is providing links to Ainorsoft Password Recovery Bundle 2.5 as a courtesy, and makes no representations regarding Ainorsoft Password Recovery Bundle or any other applications or any information related thereto. Any questions, complaints or claims regarding this application Ainorsoft Password Recovery Bundle 2.5 must be directed to the appropriate software vendor. You may click the publisher link of Ainorsoft Password Recovery Bundle on the top of this page to get more details about the vendor.